It is always a good idea to have one or more spare keys made for your car. Sometimes when you least expect it, these could help you through a difficult situation. In case you have lost or misplaced the original key. At AZ Locksmith, we provide easy solutions for any car key duplication. These are some examples of different type of keys we can do. For instance: transponders, remotes, card keys, proximity keys (smart access), and / or a mechanical access keys to open the doors. In addition, we offer affordable and flat prices, without any extra fees. Why should I have a duplicate key? Making a spare key in most cases is more affordable. It may prevent any code that may be needed if a whole key needed to be made from scratch. Having duplicate car keys made is not only quick and easy, but also within your means. 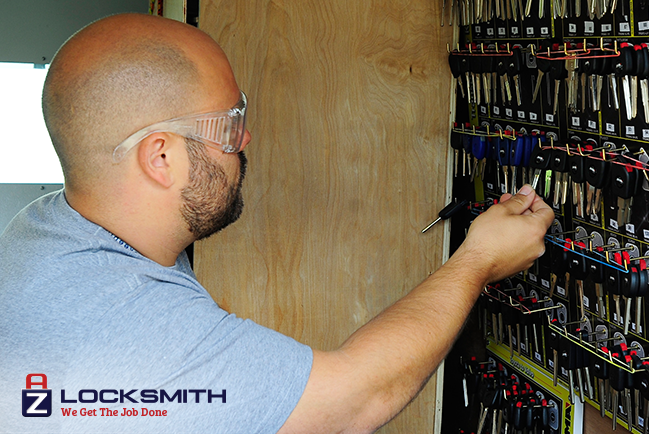 The professional staff at AZ Locksmith are able to create duplicate keys in time. They make sure you’re relieved from any concern you have of just having one key. To get an extra key made, call us anytime and we can make an appointment to create a duplicate key for you. What is involved in this process? First, we need to know the type of duplicate key you want, whether it would be a blade key, remote key, or proximity key and if that key is compatible with your vehicle, then depending on the type of key you want, the key is cut according to the original key and if necessary, also programmed the same way so the original key will still work as well. Aside from key duplication services, we provide different auto locksmith services 24/7.